Learning List has reviewed DynaStudy’s DynaNotes Math Eligible TEKS Program for grades 6-8. DynaNotes is a supplemental learning aid to support mathematics instruction in grades 3 through Algebra 2. Student resources are in print format and teacher materials are on a CD-ROM. Instruction at each grade level addresses each of the Texas Essential Knowledge and Skills (TEKS) assessed by the applicable STAAR test. At each grade level, DynaNotes presents content using a four-page set of “Student Course Notes” and an accompanying “Student Activity Book.” Student Course Notes are coated cardstock notes broken into categories related to the TEKS strands for each grade level (e.g., Geometry and Spatial Reasoning). Categories are broken into sections that address a subset of the strand (e.g., circles) and provide notes on specific content (e.g., radius, diameter). Section notes summarize fundamental concepts in short, easy-to-read text, clear examples, and colorful illustrations, tables, and graphs. The Student Activity Book provides a set of corresponding activities for each section of the Student Course Notes. Teacher materials are provided on a CD-ROM and include “Student Course Notes and Lessons,” TEKS alignment documents, and answer keys to problems in Student Activity Books. Course Notes and Lessons present the Student Course Notes for each section and an accompanying lesson plan. Lesson plans present the TEKS addressed by instruction, whole group warm-up exercises and discussion questions, and references to the accompanying activities in the Student Activity Book. * The content in this section is provided by or adapted from DynaStudy. DynaStudy’s DynaNotes Science Course Notes are app-based supplemental learning aids that support instruction in high school biology and chemistry courses and science courses at grades 5 and 8. At each grade level, Course Notes complement TEKS-aligned comprehensive, core science curricula and support preparation for STAAR testing and end of course exams. Students can create easy, password-protected journals on individual or shared iPads or Android tablets. The apps are grounded in TEKS, personal to each student and connected to the outside world. Course Notes summarize fundamental concepts and define vocabulary in short easy-to-read passages that include clear examples, colorful illustrations, and links to external resources with relevant content (e.g., NBC Learn). Instruction focuses content tested on STAAR exams and includes eligible content from prior grades. Course Notes do not include hands-on activities or practice in problem-solving skills. 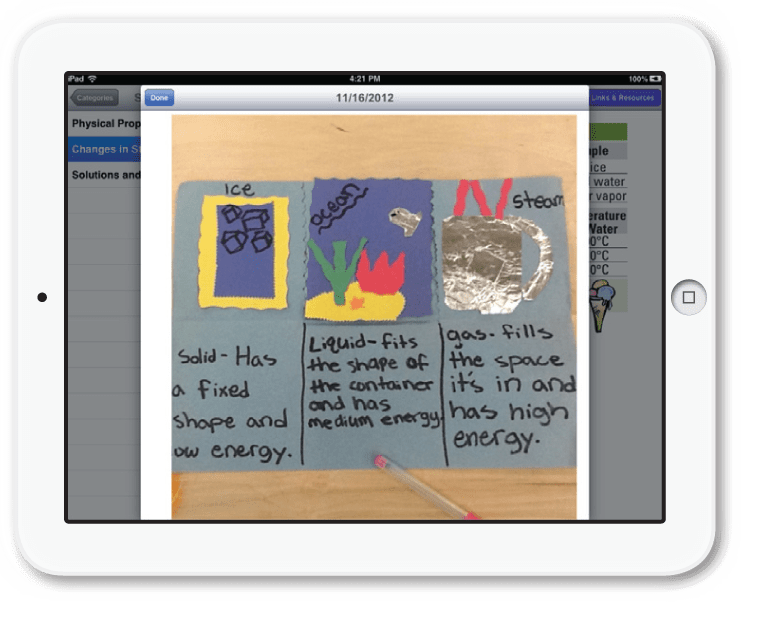 However, teachers are able to expand notes to include additional information, activities, and experiments aligned to the TEKS. Course Notes are easy-to-use for both students and teachers. Students are able to add their own notes in text format or by using tablet camera functions to attach photographs. All notes are local to the device, so once the app has been downloaded, all course notes and student notes are accessible without an Internet connection. Links to external resources, however, continue to require Internet access. Effective student tools yield many benefits for teachers. While students use DynaNotes apps, teachers are freed to do more. DynaStudy, the creator of DynaNotes, is an award-winning educational publishing company headquartered in Austin, Texas. More information is available about this and other options on their website.